Last weekend I was actually planning on making some cauliflower pizzas and using some red peppers to make a ‘nomato’ sauce, but I decided to make a skillet dish instead using some chicken breasts that I had in the fridge. 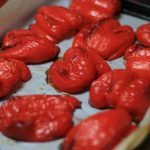 The first time I made roasted red peppers, I was surprised at how much they tasted like tomatoes once I mashed them all up. If you’re allergic to tomatoes, red peppers could be an awesome replacement that taste just like tomatoes! 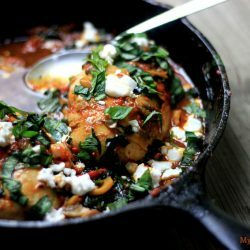 I decided to make this Red Pepper Skillet Chicken & Goat cheese and added a few more ingredients to it. 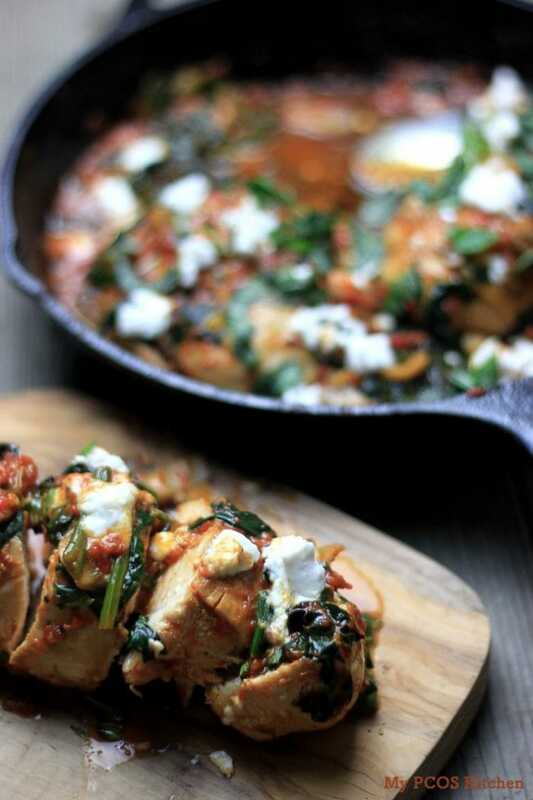 Apart from roasting the red peppers, this meal doesn’t require a lot of time to make! 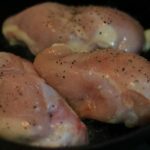 I decided to use some chicken breasts (and one thigh) because that’s what I had on hand, but you could use whatever part of the chicken you want! The only reason why this dish makes three portions is because only three chicken thighs/breasts fit in my cast iron skillet. I bet this meal would taste amazing with some chicken wings and drumsticks! I decided to top the top of the dish with some fresh basil, actually with the last basil of my little garden for the season, but it ended up looking like the wilted spinach! Oh well, the flavours were all there, so I guess it’s okay! I took some pictures of all the steps so that you can see how I made it! I halved some peppers, roasted them in the oven for about 40 minutes, peeled and mashed them in a food processor. I then proceeded to grill the chicken and make the ‘nomato’ sauce! 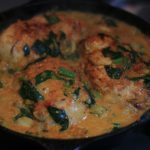 Cooked in a homemade roasted red pepper sauce, these chicken breasts are to die for! Slice the red peppers in half, remove the stem and seeds and plate on a baking tray over some parchment paper. Bake in the oven for 50 minutes, or until the pepper's skin starts to blacken and can be peeled. Take the peppers out of the oven and let cool down. Once cooled, remove the skin with your hands. 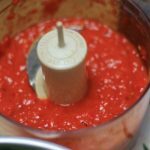 Add the peeled peppers to a food processor (or a blender, stick blender) and mix until smooth. Sprinkle the salt and pepper over the chicken breasts on each side. 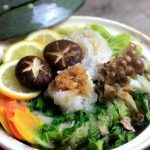 Mince the garlic, slice the mushrooms, shred the spinach and slice the fresh basil leaves. 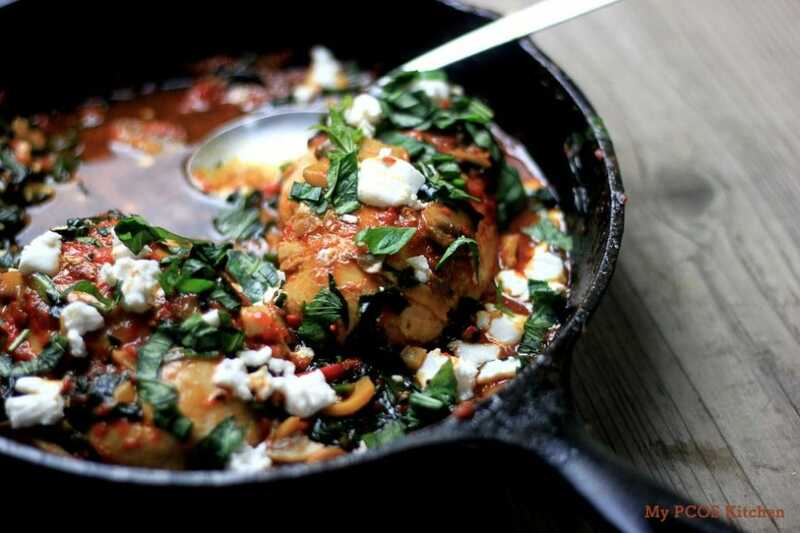 Heat the olive oil in a large cast iron skillet and place the breasts in. Cook on each side for 4-5 minutes on medium heat. Once each side is grilled, add the garlic and mushrooms and cook for a minute. Add the pureed red peppers and 1/2 cup of water. Cover and let simmer on medium-low heat for 5 minutes. Uncover, add the cream and the spinach. Move the spinach around with your spatula until they are completely wilted. Cook for a minute, just so that the cream and red peppers combine and turn off heat. Crumble the goat cheese over and top with the sliced basil leaves. Hi, Mira! 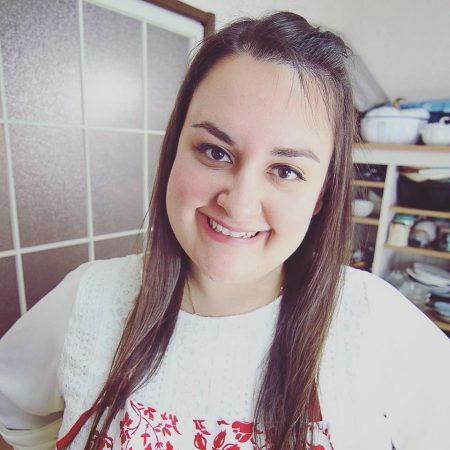 I am loving your blog and all your delicious recipes! Do you have any ideas for what I could use in place of cream? 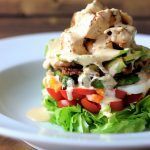 I’m struggling a bit with dairy, and while I could probably handle the amount of cream this recipe calls for, I’m trying to find alternatives. Goat cheese is no problem for me, though! 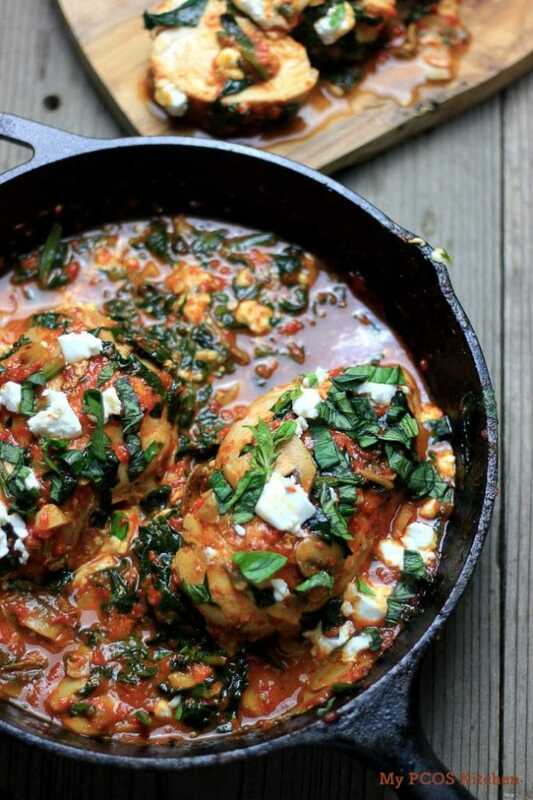 For this recipe, you could add either more goat cheese with some almond milk? The cream doesn’t do too much in this recipe, so if you added more cheese and some almond milk and cook it down, it’d be nice and creamy. This looks wonderful! I love the idea of using roasted peppers in place of tomatoes. 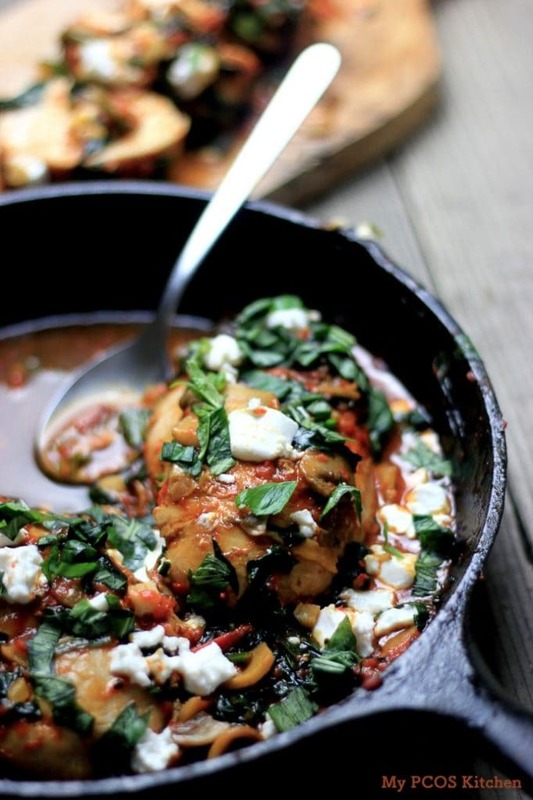 I have a bunch of red peppers in my fridge…may have to make a spin on this tonight! It’s sooo good omg. 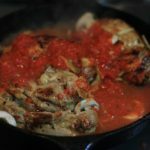 I really like making a big batch of this sauce because you can change it, add spices and make it into so many other dishes! 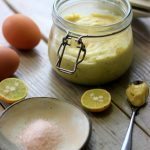 It’s really good on cauliflower pizza or with zoodles as a meat sauce!